Formerly United Methodist Free Church of 1863-4. Architects: Hartland and Son of Cardiff (who also designed Tabernacl Chapel, The Hayes). Purchased by Freemasons, 1893, conversion 1895. Bath Stone facade with round-arched openings with keystones and order of Doric pilasters; cornice and parapet with inscription "MASONIC TEMPLE", hipped slate roof. Three bays with, to centre, triple arch window over blocked doorway; to each side, tall arched window. 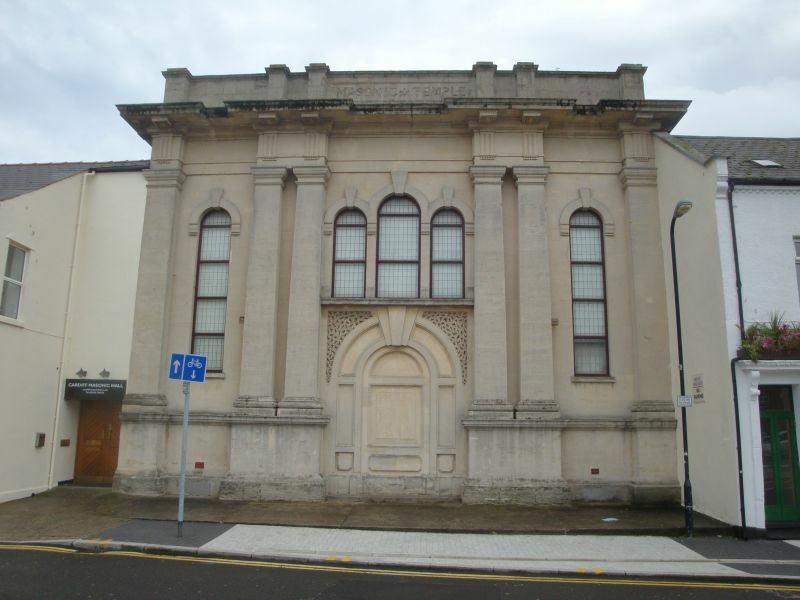 Striking former chapel by one of best of Cardiff's C19 chapel architects; facade closes vista down Bridge Street. Near corner with Bridge Street. To S of No 48. To L of No 46. To rear of Ebeneser Chapel. To L of No 44.